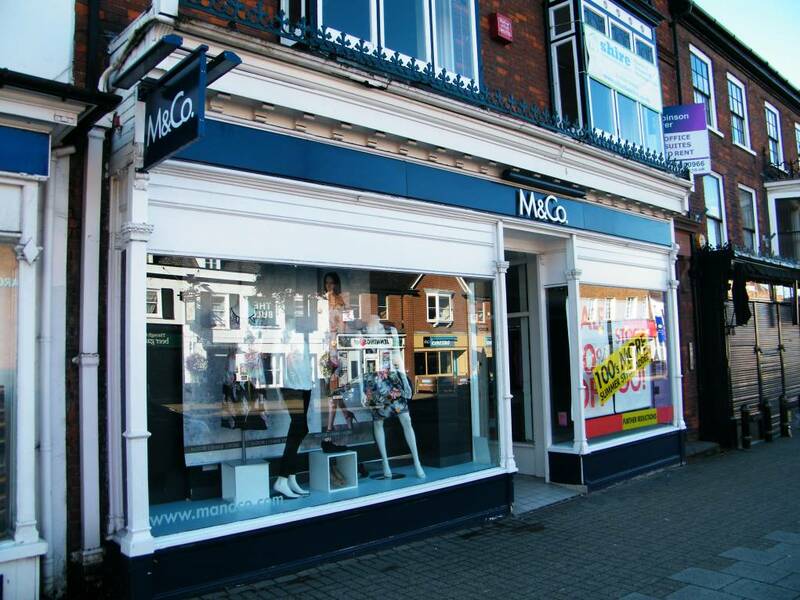 As can be seen in the history list above the original shop at this location was a bakers - firstly Thomas Kelleway, then Joseph Crosier and then from 1851 his widow Mary Crosier. In 1841 Joseph and Mary Crosier were at Prospect Place in Paradise Row - what's now All Saints Road, immediately adjacent to All Saint's Church. In 1871 the building was unoccupied, but on the 1881 census Frederick Meacham's saddlers was listed between George Bradfer's Clothiers Shop - No.49-51 High Street, and Arthur S Wigg's jewellers, which between 1880 and about 1884 was thought to have been at No.35 High Street. There are no further details given on the census or have been found elsewhere about the exact location of the saddlers, so this means that there were a few possible locations - either No.37, here at No.39-41 or No.43-47 High Street. Frederick Meacham is listed with his wife, 3 children and a servant, so their house must have been fairly large - this most probably exludes No.37 High Street. This leaves the location of the saddlers to be here or next door at No.43-47 High Street. Wiggs jewellers definitely eventually moved into No.43-47, but in 1881 that building was still very much just a house and it's frontage was most probably not suitable for a saddlers shop. In the absence of any other evidence at this time this leaves No.39-41 as the most likely location for the saddlers. Stealing a Saddle. - Samuel Traylen alias Blondin, and John Fuller, alias Chippenham Jack, both of Newmarket, were charged with having stolen a saddle, the property of Sir Anthony Rothschild, from the Palace stables, the occupation of Mr. Hayhoe, of Newmarket. - Frederick Meacham, saddler and harness maker, of Newmarket, deposed that on Friday afternoon last the prisoner Fuller called at his shop and asked him if he would buy a saddle, for which he wanted 15s. He told him to take it to him to see, and did so about hour after, and he then asked him where got it from, and he replied that it was all right. Mr. Meacham, suspected something wrong in the matter and wished him to leave it, and Fuller then said that he wanted the money, and he let him have a shilling on account and he then went examining the saddle. He, the witness, found Sir Anthony Rothschild, marked in ink under the flap. Again between six and seven the same evening Fuller called at his shop and asked for money, when he told him that he believed the saddle was not right, and that knew where it came from. Shortly afterwards Traylen called and asked about the saddle, and wanted to know what Fuller had upon it, and told him he given him a shilling. He wanted him to give up the saddle, and said he should give it to the party to whom it belonged, and in course of the evening he informed Mr. Hayhoe, Sir Anthony’s training groom of it. - James Bartholomew, head lad under Mr. Hayhoe, was next sworn, and he identified the saddle the property of Sir Anthony Rothschild, and the name, as described by Mr. Meacham, was written upon the saddle rim. - Frank Chapman, a stablelad in the employ of Mr. Hayhoe had used the saddle, also identified it as the property Sir Anthony Rothschild. He knew it on account of the stirrup leather being bitten at the end a horse. - Supt. Benson deposed : From information received went to shop, and obtained from Mr. Meacham the saddle he then produced, from facts he received from him and from other circumstances he knew of, caused the two prisoners to be apprehended p.c. Ives who brought them to the police station. Mr. Benson, said he then charged them with stealing a saddle belonging to Sir Anthony Rothschild, from Mr. Hayhoe’s stables in the Palace yard, and at that time Fuller said that the day when the saddle was spoken about he was out of Mr. Brown’s shop in Wellington street when came out of the Sun Lane, and called to him, saying got saddle, and asked him if could sell it for him, and he, Fuller, said perhaps Mr. Meacham would buy it, and he then took the saddle round to Mr. Meacham’s shop. - In reply to this statement Traylen then said Jack is quite right, and he knows no more about it than that. - Mr. Benson further said in his evidence the direction in which Traylen was then coming with the saddle, down the Sun Lane, would be the way a person would ordinarily take on coming from the stables from which the saddle was stolen. - Neither prisoner wished to ask the Superintendent any questions, and both pleaded not guilty. - Fuller then made the following statement: - I was coming from Mr. Brown’s shop when this man was coming down the Sun Lane with a parcel at his back. He called me and then came over and said he had got a saddle, and where could he sell it. I said any saddler would buy it if it is your own, and I said take it to Mr. Meacham. I asked him what be wanted for it, and he said 15s. I took the saddle round to Mr. Meacham, and told him the man wanted 15s. for it. He said he would look at it, and told me to call again at tea time. I left it there, and when I came back Traylen was waiting, and asked me whether I had got the money, and I said No. He said You ought to have brought the money or the saddle. Traylen did not tell me where he got the saddle from until after Mr. Meacham refused to let it out of his shop. That is all I have got to say. - Traylen said he reserved his defence till the trial. They were both committed for trial at the next Quarter Sessions at Cambridge. In 1891 Frederick had moved to live at No.5 All Saints Terrace in Paradise Row (now All Saints Road) and as listed in the 1892 White's Directory his shop was in Market Street. In the 1891 census the shop was occupied by Cambridge born fruiter James Creek, who's also shown in the Newmarket Street Directory of that same year. His time in Newmarket was short though as by the 1901 census he was back running the Nelson Nursery at Fulbourn (an 1889 Cambridge Daily News advert shows that he was running the nursery at the same time as owning the shop in Newmarket). Previously in 1883 James had his fruiterer & seedsman shop in Market Street, while living at No.2 Denson Terrace - now No.17 Rous Road. Born in Newmarket in 1862 Albert Robert Golding was the third son of Samuel Golding, clothier of Cheapside Store - No.11 Wellington Street and Goldings - No.67 High Street. In 1881 Edwin Stott from Steyning, Sussex had his ironmongers shop in the High Street adjacent to Bird's Alley - an area no longer present in Newmarket, but which was originally at the location that's now Lloyds Bank - No.46-48 High Street. He employed 3 men. At the same time in 1881 Albert Golding was living and working as an Ironmongers Assistant for George Samuel Cooper at No. 6 Meat Market, Bury St Edmunds. Edwin Stott's ironmongers is still shown in the High Street in Kelly's Directory of 1883, though it was sometime between then and before 1891 that Edwin retired and moved with his family to No.7 Out Risbygate Street in Bury St Edmunds. Albert took over Edwin's Bird's Alley shop, though it's not known quite when, as in 1891 the ironmongers shop is listed in the census as being unoccupied. If you compare the 1890 and 1895 photos of the High Street in the photos section below you'll see that sometime between these two dates the original two storey house that stood here had been demolished and a new three storey house had been built. This transition must have marked Golding's move across the High Street and also the construction of his new premises here - Surrey House. In 1891 Albert was living with his father Samuel and sister Elizabeth in The Glen - the house that used to stand where The Avenue is now. Albert married Bessie Bailey in Newmarket in 1893. The last trade directory that shows Albert's ironmongers in the High Street is 1904 and by the 1911 census brothers Frederick William and Stanley Hobbs had moved into Surrey House. The 1916 Kelly's Directory lists their shop as Hobbs Brothers, ironmongers. In the 1911 census Albert Robert Golding was living at Briarfields, No.65 Fornham Road, Bury St Edmunds. Briarfields was put up for sale by Rutters estate agents in June 1918. - We record with much regret the death of Mr Albert Robert Golding, who passed away at his residence, 63, Eversfield Place, St. Leonards, on Thursday last, aged 57 years, after an illness which lasted only about a week. He had an attack of influenza and haemorrhage supervened. Mr Golding was the third son of the late Mr Samuel Golding, clothier, of Newmarket, and after serving his apprenticeship with a leading firm at Bury St. Edmunds, purchased the old-established ironmongery business of the late Mr Stott in Newmarket. Some time later he transferred the business to larger and more up-to-date premises on the opposite side of the High Street, which he purchased and converted, and carried it on very successfully up to 14 or 15 years ago, when he sold it to Messrs. Hobbs Bros., and retired, then taking up his residence at Bury St. Edmunds. A few years ago he removed to St. Leonards. Mr Golding married Miss Maud Bailey (a niece of the late Mrs R. Sherwood), and leaves a widow and one son. The interment took place at the Borough Cemetery, Hastings, on Tuesday. The principal mourners were Mr Ward Golding (son), Mr W.A. Golding, of Newmarket (brother), Mr Leslie Golding (nephew) and the deceased gentleman's solicitor. A number of beautiful floral tributes were sent by relatives and friends. Many thanks to Geoffrey Woollard for the above newspaper article. Bessie only outlived Albert by a few weeks and died at 63 Eversfield Place, St Leonards-on-Sea on 13th March 1920. This was the time of the 1918 flu pandemic, which lasted from January 1918 until December 1920 - presumably the couple died as a result of this. Frederick William and Stanley were two of the sons of Robert William and Fanny Elizabeth (neé Plumbe) Hobbs. 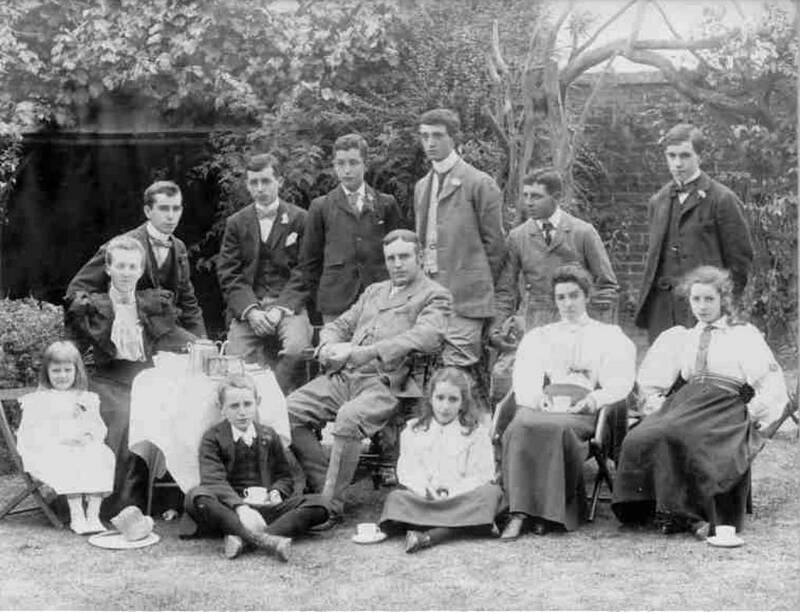 Robert William can be seen seated, surrounded by his family in the photo below, taken c.1898 - Frederick William and Stanley are the two on the left in the rear row. Kelmscott is another of those locations like Newmarket that has a complicated county identity - the address of the main village is Kelmscott, Oxfordshire - the address of Bradshaws Farm House is Kelmscott, Lechlade, Gloucestershire and the main BMD registration district at the time of the birth of Frederick William and Stanley was nearby Faringdon - which is in Berkshire ... all of this makes interpretation of formal records quite confusing. Frederick William Hobbs was born on 2nd October 1878 at Kelmscott. He married Caroline Reading in 1907 in the Faringdon district. 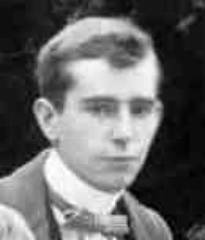 Stanley Hobbs was born in December 1879 at Kelmscott and in 1907 he married Emmeline Mary Badham in Gloucestershire. By 1911 at the latest (most probably in 1907) both the brothers and their families had moved here to Surrey House in Newmarket (though Caroline was away visiting at the time of the census). By 1916 Stanley had moved to Stradbroke - No.38 Rous Road. But by 1925 he seems to have left Newmarket altogether, and on the 1926 Newmarket Street Directory Frederick William Hobbs is listed here as the 'Sole Proprietor'. Frederick William died on 14th July 1934 and is buried in Newmarket Cemetery - the 1936 trade directory shows Caroline Hobbs still living here, which presumably was the case until she died on 22nd March 1952. She's also buried in Newmarket Cemetery. 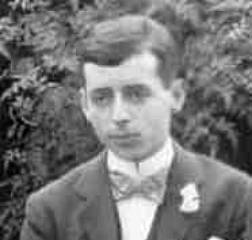 Stanley died in the family home at Bradshaws Farm House, Kelmscott on 9th December 1960. The business F.W.Hobbs & Company Limited was incorporated on 20th February 1936 (shortly after Frederick William's death) and continued trading until 13th August 2008, when the company was finally dissolved. F.W.Hobbs, Ironmongers stayed here in Surrey House until around 1982, after which it moved to No.28 St Mary's Square. It's final owners were Andrew Richard Owen, Peter Francis Owen and Julie Owen. Proposal C/Use of 1st and 2nd floor to offices. Many thanks to Peter Norman for the photos 'NKT25 High Street Newmarket 1950', 'Newmarket High Street c.1900', 'Hudson & Kearns Newmarket High Street 1895', 'Newmarket High Street 1890' & 'High Street c.1890s'. Many thanks to Roger Newman for the postcard 'Newmarket High Street 1903'.